Well, I ordered my konro from Chef's Armoury the other day, so in anticipation of its arrival I decided to cook some yakitori. 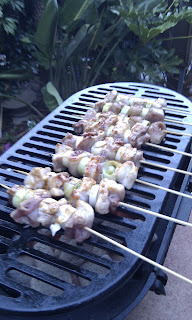 Just to clarify, a konro is a small coal fired stove well suited for barbequing - particularly yakitori. So I skewered some chopped chicken thighs with sliced leek, and prepared the sauce from a combination of soy, mirin, castor sugar, water and a little corn starch dispersed in cold water. A good quality soy sauce always helps towards achieving a rich flavour. The chicken was grilled on a cast iron hibachi with occasional basting with the sauce. Sitting out on the deck with a cold beer, this was the perfect way to cook dinner on a lazy afternoon. This particular cast iron hibachi is not an authentic Japanese stove, but the konro will be, and I will post about that when it arrives. Scientist? Musician? Writer? All of the above......or perhaps none. Copyright 2014 harajuku32, All rights reserved. Simple theme. Powered by Blogger.